How can we prevent quality professionals from being perceived as a “thing of the past”? 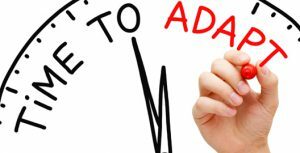 What adaptations need to occur in the quality industry as a whole and on the individual level to revitalize the industry and attract the next generation of quality professionals? Daniel John Zrymiak is from Surrey, British Columbia, Canada. He has worked in quality for two decades, mostly recently at Accenture as a Mobilization Lead. Daniel is active in ASQ as a Quality Press author and reviewer, member leader, and Technical Committee chair (Finance and Governance – Quality Management Division). He blogs at AQualitEvolution. Guy Bigwood Is based in Spain, Guy Bigwood is the sustainability director of MCI, an association management company. He is responsible implementing corporate social responsibility throughout MCI’s 48 global offices, and manages a global consulting practice that provides strategic guidance to businesses, associations, governments, and the United Nations. His blog is Less Conversation More Action. Luigi Sille is the Quality Manager at Red Cross Blood Bank Foundation in Curaçao, an island in the Caribbean. He has been a senior ASQ member since 2014, and blogs at sharequality.wordpress.com. Sara Haynes is a chemical engineer but hasn’t let that stop her from developing a personality. Sara is a certified Six Sigma Black Belt and Quality Engineer, a Lean project manager, holds a Mastery of Re-Engineering and a green belt in QFD. Prior to consulting, Sara was the Director of Operational Excellence at SMART Technologies, one of the top 20 high-tech firms in Canada. She has over 15 years experience in developing and implementing continuous improvement programs and executing business process transformations in a wide range of industries she blogs at Six Sigma Solutions. Pam Schodt is an ASQ Certified Quality Engineer and a member of the Raleigh, North Carolina, section of ASQ, where she volunteers on the Communication Committee. Her blog, Quality Improvements in Work and Life, includes posts about certification testing, book reviews, and lifestyle issues. She also blogs about technology issues and gardening on two other blogs. Currently, she is active as an iStock photo contributor and social media advisor. Robert Mitchell has 30 years of quality experience in manufacturing, non-profit and civic organizations, and manages corporate quality and Lean Six Sigma operations at 3M. He is incoming chair of ASQ’s Minnesota section. He blogs at Quality Matters. Steward with professional diligence and accountability. Also, by containing the following Distractors, we can avoid situations that besmirch the impressions of Quality professionals. Silver Bullets: Quality practices (i.e. automated testing, Kaizen blitz), which can be effective within a structured quality framework, are promoted as instant solutions. When lofty expectations don’t materialize, all future Quality initiatives are received with disdain and cynicism. Generational Buzzwords: This pertains to schemes which are overused, transcending original context, leading to misinterpretation and mockery. Past examples include Total Quality Management, Business Process Engineering, Balanced Scorecard, and now current practices like Six Sigma and Lean are equally disparaged. Instant “Expertise”: Unilateral claims of expertise, without having a proven track record or a history of valid, peer reviewed publications or credentials, reminds me of a movie character. Without professional barriers to entry of education, duration of service, and technical proficiency, many individuals unilaterally declare their own expertise and penetrate the marketplace, diluting the image and stature of Quality practitioners. This is supplemented by questionable providers who offer ad hoc credentials without prerequisite qualifications or examinations. As Quality Professionals, we must distinguish ourselves from our Distractors by adopting the traits of diligent Practitioners, accountable Stewards, versatile Intellects, and innovative Altrusits. Like the Pioneers of Quality (i.e. Deming, Shewhart, Juran), we must demonstrate our example in work and life with conviction and authenticity. I have never considered myself as part of the quality industry. Yet my career has been focused on driving quality and improving results. I use the same tools and processes as quality professionals but my viewpoint is different from many of the “gurus” I have worked with. Perhaps this is something quality professionals around the world should consider. It’s the results that matter and not the language or tools you use to get there. How can we prevent quality professionals from being perceived as a “thing of the past”? Quality is a process. It’s a process that can help any organization in their journey for continual improvement. Continuous improvement of their products and/or services, this is one of the most important aspects of a quality management system. Continuous improvement has an influence on customers. 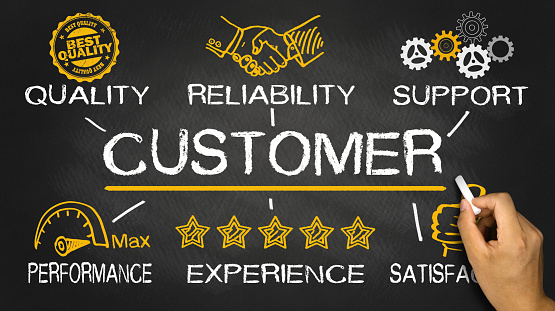 Customer satisfaction is another important aspect of a quality management system. Customer satisfaction is the key to staying in business. We, as quality professionals, must keep doing our job and keep showing senior management where they can eliminate waste, improve the quality of the products and/or service. Better quality results in happy clients, so we can talk about customer retention, and getting new customers. We need to show them that our actions will have a positive impact on the organization. Senior management has to become an active part of the whole quality management system. In the past people thought that quality professionals were like COPS of an organization. We, as quality professionals, we are not cops; we are here to guide the process, to coach and educate others. Quality Professionals are a part of the team, and are not above the team. We are very valuable for any organization trying to move on, trying to deliver better quality of products and/or service. Quality professionals need to put more emphasis on prevention rather than inspection, more emphasis on coaching, educating and inspiring others to deliver quality. We need to work as a team, to keep improving the process. What adaptations need to occur in the quality industry as a whole and on the individual level to revitalize the industry and attract the next generation of quality professionals? If you ask around, a lot of people don’t even know what quality professionals do. While attending school, quality was never brought up, it never even occurred to me that a career in quality was possible. Why is that? 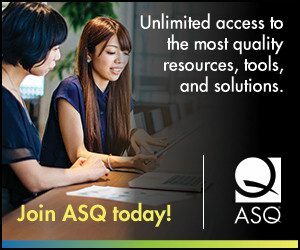 When I started attending the ASQ WCQI, I realized that quality professionals were becoming more and more active. But when you leave after the conference, what then? What do you as a quality professional do to motivate, educate and inspire others around you? We as quality professionals must do more. Start educating people close to us, like family and friends. Talk about quality, the importance of quality, continual improvement, customer satisfaction, and what we as quality professionals do. It’s up to us quality professionals to educate the community, so progressively more young adults get interested/inspired to start their journey as a quality professional. It’s up to us as quality professionals to spread the word! The “Sweet Spot” for Quality when I was first put in charge of quality for a manufacturing organization, my boss cautioned me against over-rotating on quality. “Over-rotate?? ?” I thought, “How could we have too much quality?” But unless your quality department is staffed by volunteers, there is a cost to inspections and audits, as well as quality techniques like FMEA and Six Sigma. 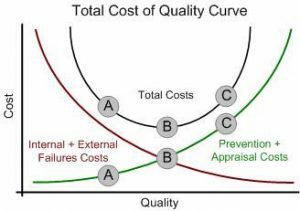 Juran and Feigenbaum describe this balance in the Total Cost of Quality. where customers are satisfied and costs are minimized. That sweet spot is going to be different for each company – depending on whether you are manufacturing a Lexus or a Kia. And the sweet spot can shift can change dramatically and unpredictably with the introduction of new competitors that suddenly raise customer expectations. As quality professionals, one of our roles is to search out that “sweet spot” of quality for our organizations and clients. One way is to shift prevention and appraisal costs ever lower through innovation, in the form of new technology, new concepts and new skills. Some of the best technological innovations I’ve seen in quality include on-line surveillance and monitoring of off-shore manufacturers. This reduces the cost of travelling to manufacturing locations or hiring local staff to oversee production quality control, as well detecting and correcting quality problems before you have a warehouse full of defective products. Other innovations in the field of quality include new concepts like poka-yoke or rapid-deployment QFD. What new innovations are you excited about in the field of Quality? Young people may be less aware of the quality profession because it is not a stand-alone industry. Those who take pride in their work in any organization, however, would support excellence in quality. From airbags to pharmaceuticals, digital communications publicize quality issues to the general population. The next step then is to promote solutions with management of quality systems by quality professionals. Quality professionals should employ marketing to promote the field. Participate in company tours to shine a light on quality positions in your organization. Publicize your quality systems as opportunities arise with marketing documents and local media coverage. Rather than wait for the subject to be brought up in Q&A, seize the opportunity to talk about quality systems. This can lead to questions about educational requirements, certifications, and careers in quality. Actively represent the quality system in your organization. My years of experience in manufacturing as a quality professional, coupled with my experience as a Baldrige Examiner where I have evaluated organizations across the economic spectrum of healthcare, education, government, small business and non-profits leads me to conclude that the Quality profession is not dying, rather transforming and expanding into traditionally non-Quality departments or operations of the organization. For example, a key tenant of Lean is that everyone – at all levels of the organization – becomes a problem solver. Six Sigma belts are sometimes the Quality professional but more often the subject matter expert in a given discipline or function, and is positioned as a career development opportunity perhaps leading to future management or leadership positions. Many non-manufacturing organizations have replaced the traditional “Quality Dept.” with employees staffed in departments responsible for “Customer/Patient Satisfaction” or “Operational Excellence” or the like. Many service industries have developed their own quality certifications specific to its own needs, mission, vision and culture. Which begs the question, is there a fulfilling career opportunity for someone pursuing a role – or perhaps currently feeling trapped (i.e. career plateaued) in a current role – in the Quality function? A real concern of mine is that many organizations seem satisfied by equating quality to standards conformance. Their quality professionals are primarily engaged in documenting procedures and requirements, auditing for compliance, and issuing reports. Though a required set of activities in certain compliance-based industries, this in itself is not a particularly engaging nor growth activity for the quality professional. A primary role of Quality is Business Process Management to improve the organizational white spaces – the communication and handoffs – between departments to assure operational excellence. By first focusing on and optimizing these internal customer-supplier relationships within the organization the Quality professional builds organizational capability to better serve the needs of its external customers. A Customer-first culture must be nurtured by leadership to enable organizational performance excellence. A genuine focus on the customer/patient always results in a more engaged workforce leading to process improvements, innovation and performance excellence. More ASQ focus and training to aid the technical Quality professional in making the successful transition to management and leadership. More ASQ involvement with community colleges, universities and business schools to increase the awareness and discussion of quality principles and the Baldrige Criteria. 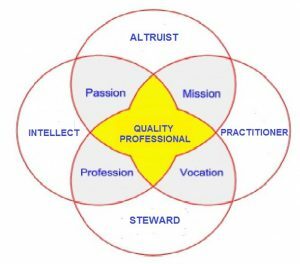 The successful Quality professional has adopted a philosophy of life-long learning beyond the areas of technical Quality and data analysis to broaden and strengthen his/her individual capabilities, in both “hard” and “soft” skills. The future of Quality is us. We cannot afford to sit idly by, or risk irrelevance; seek new opportunities and experiences. (e.g. What is the role of Quality in automation and robots?) “The best way to predict the future is to create the future” [Peter Drucker]. There is no “quality industry”. We do not need to prevent something that is so ill-defined: i.e., a deterioration of attitudes towards quality management professionals. For my part, I am concentrating on apprenticeship programmes as well as my other work. I think apprentices have been given short shrift in their experience of formal quality system and how they affect their working environment and possibly their careers .At one of my workshops I had registrations from eight PhD student/apprentices from a university faculty of engineering, as well as aerospace manufacturers and suppliers. We can prevent quality professionals from being perceived as a thing of the past by staying relevant and demonstrating our value everyday. In the fight against perception, put reality right in front of the person who’s view is obstructed. Go to work, do good work, drive down cost, increase efficiencies and make a big difference. I think that there is a small of people who can be an ideal Quality professional but being the “Ideal” is perceived by different people depending on their expectations or requirements.